For after your Lazarus comes Lazarus. 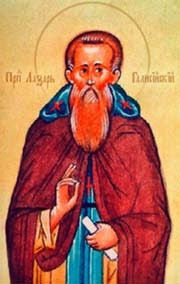 Our holy Father Lazarus was born in 968 in a village close to Magnesia on the River Meander. At the moment of his birth, a blinding light filled the house and the women ran outside. On returning indoors, they found the infant facing the East, his hands crossed on his breast, as if in prayer. He was given the name of Leo in holy Baptism. When he was six, his parents sent him to a priest called Leontios to learn to read from the books of the Church. Three years later, he was sent to Orobos where the Notary George was his teacher. At the age of twelve, his uncle Elias, a monk of the Monastery of the Kalathi, took charge of his ecclesiastical education. Meekness, humility, love of study and above all, zeal for prayer and for the divine services, were all to be seen in Leo during his schooldays. In his compassion and love for the poor the boy would give away his teachers’ goods by way of alms, and was often beaten for his generosity. He longed so ardently to visit the Holy Land, sanctified by the Passion of Christ, that he ran away from the Monastery. His uncle fetched him back and made him stay for two years more, before sending him to the Monastery of Stroubilion to complete his legal studies with a notary there. But Leo soon surpassed his master in the science of sciences and art of arts. Three years later, he made another attempt to go to the Holy Land but was once again apprehended and made to return to the Monastery. But within ten months he was permitted to set out for the Holy Land, with the blessing of a nearby Stylite. However, he met a holy ascetic on the road who persuaded him of the hazards of his intended pilgrimage and advised him to enter a monastery near Attalia. He received the holy Angelic Habit there, taking the name of Lazarus, and he zealously applied himself to the life of ascesis. He loved fasting as much as the glutton loves food. He shook off the heaviness of his flesh by vigils, that his soul might fly up to the heights of contemplation. The renunciation of his own will and his obedience to his Abbot and spiritual father were an example to all the brethren. When, some time later, his spiritual father died, the new Abbot allowed Lazarus to withdraw to a cave near the monastery where he could converse alone with the one God. There for seven years he struggled heroically against countless demonic temptations, and then set out at last for Jerusalem. After worshipping at the Basilica of the Resurrection and at the other Holy Places, he went to the Monastery of Saint Savvas where he was accepted into the brotherhood. But the other monks could not cope with his love of solitude and ascetic zeal, and, since no compromise seemed acceptable to the ardent servant of God, the Abbot decided that Lazarus would have to leave. He went to the Monastery of Saint Euthymius for a while, but then returned to Saint Savvas, to the great joy of the brethren. He stayed there as sacristan for six years and, in spite of his reluctance, was ordained priest by the Patriarch of Jerusalem. Following the ancient tradition of the monks of Palestine, Saint Lazarus would spend all of Great Lent until Palm Sunday in the burning wilderness, having taken nothing with him. Letting Divine Providence direct his path, he would feed on the few plants that grew there and drink the smallest amount of water. When the Saracens seized Jerusalem and its environs, he made his way back to his native land with a few companions, in obedience to a divine revelation. On reaching Ephesus, he joined two monks who were living in ascesis near a chapel dedicated to Saint Marina not far from the city. There he built a pillar with a roof where he devoted himself to greater ascesis than before. After a while he removed the roof, so as to imitate more closely Saint Symeon the Stylite in his way of life. He remained thus at his station in all weathers, exposed to the elements and exhibited by God as a spectacle to the world, to angels and to men, as the Apostle writes (1 Cor. 4:9). His renown spread quickly, and crowds came from all quarters for his blessing, to listen to his spiritual teaching and to receive the food that he liberally distributed to the many poor folk among them. His two companions, fearing that his open-handedness would leave them nothing to live on, decided to part from him, but other disciples came. They built cells at the foot of the pillar and enlarged the chapel. Saint Lazarus dwelt on this pillar for seven years. He had no more than a few moments sleep each day and was satisfied with a small portion of barley bread and a few mouthfuls of water. He even loaded himself with heavy iron chains, a form of ascesis disapproved of by other holy fathers. But the quiet (hesychia) that he sought was not to be found there, so, unknown to all, he came down from his pillar one night and left that place. He found refuge in a cave, previously sanctified by the monk Paphnutios, on the steep and all-but-inaccessible slopes of Mount Galesion. He had been there only six months when the Metropolitan of Ephesus ordered him back to Saint Marina’s to look after his disciples. However, he returned to Mount Galesion in the following year accompanied by five monks. He lived alone in the cave, and every week the brethren brought him a pitcher of water and some vegetables. He left only to ascend a new pillar built for him nearby, on which he lived in utter privation. One day he knocked over his pitcher but would not come down on that account and very nearly died of thirst. As more disciples arrived, they built cells and a church dedicated to the Savior. After twelve years, Lazarus had another cell built higher up the ravine, to which he moved one night without telling anyone. He suffered a lot in this new hermitage from the attacks of demons who threw stones at him when they could not make him entertain their impure suggestions. In his desire to share ever more fully in the Passion of Christ, he wanted to follow the example of a woman he heard of who lived in the enclosed recess of a pillar with only her feet visible, but in the end Saint Lazarus took the sound advice of his disciples and of his mother, that it would be excessive to afflict the flesh in this way, and would not contribute to the growth of the hidden man of the heart (cf. 1 Pet. 3:4). His pillar was dedicated to the Most Holy Mother of God, and a little church was built beside it where the Divine Mysteries were served for the Saint from time to time. His thirst for solitude unassuaged, Lazarus once more abandoned his hermitage and took up his final station on a pillar dedicated to the Holy Resurrection. This third pillar, like the previous ones, became the center of a monastic settlement which numbered forty monks on the death of the Saint, while his two earlier foundations had only twelve monks each. Dwelling with God alone, between heaven and earth, the Saint still cared for the life of his monks in every detail. The pillar was built against the church wall where there was a small window, through which he was able to oversee the vigilance of his monks as they psalmodized, and to speak words of salvation to his visitors. God granted him the gift of insight and of prophecy. He foretold the date of his death; but, when his disciples implored him to remain longer in this life for their salvation, he besought the Mother of God, who granted him fifteen years more. One week before his death, Saint Lazarus called for his disciple, the monk Nicholas, and dictated a detailed spiritual testament that he signed on November 8, 1054, the day of his falling asleep. He was buried near the pillar from which his soul had risen to Heaven even before separating from the body. In thy vigilant prayers, thou didst drench thy pillar with streams of tears; by thy sighings from the depths, thou didst bear fruit a hundredfold in labours; and thou becamest a shepherd, granting forgiveness to them that came to thee, O our righteous Father Lazarus. Intercede with Christ God that our souls be saved. With great joy, the Church of Christ doth glorify thee on this day with psalmic hymns as a great light unto us all; hence never cease thou to intercede with Christ to grant the forgiveness of sins to all.